Cats adore having a bird's-eye view of their world. A feline surveying her kingdom from a high perch is the queen of satisfaction. Cats aren't particular when it comes to their terrain and any countertop or china hutch will do. Providing a cat-friendly climbing alternative not only protects your collectibles, but it affords items which may be destined for the landfill, a new purpose in life. Sand your ladder to remove any rough spots. 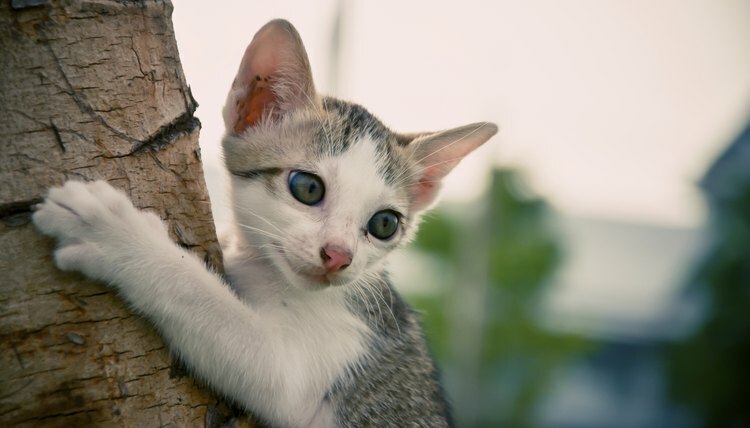 Cats adore scratching wood to sharpen their claws, but jagged pieces still pose a risk to your feline. Open the ladder and extend it to its maximum. Using the level, determine if your ladder is level. The steps should be as level as possible. The dowels also should be level. If the dowels are not level, remove them. You'll replace them later with 2-by-2s. Add shims to the bottom of the ladder's feet to level the ladder. Use wood glue to attach the shims. Allow for drying time. Measure your plywood to create a base for your ladder. You'll do this by measuring the area your ladder covers when it is fully opened. You'll be affixing your ladder to the plywood base to stabilize it and avoid tipping. Cut your plywood according to the measurements you took in step 5. Affix your ladder to your plywood base using the L-clamps and 3/4-inch wood screws. This will help stabilize your ladder and keep it from tipping as cats play on their ladder tree. Wrap the legs of the ladder with jute rope. This will create a scratching area for your cat. Attach the ends of the jute rope with a staple using the staple gun. You may want to burn the ends of the rope to keep it from fraying. Do this by using a lighter, singeing the end of the rope and extinguishing it with a damp cloth. Using the remaining plywood, create shelves for your cats to jump on. These shelves will slide through the ladder and be affixed to the steps and existing dowels or added 2-by-2 pieces. Stagger the length of your shelves so cats can jump from shelf to shelf. Cut one additional piece to create a perch on the top of the ladder. Sand to remove any jagged edges. Measure the inside width of the back of your ladder to add 2-by-2 pieces where dowels may be missing or nonexistent. Your shelves will be affixed to the 2-by-2s. Cut your 2-by-2 pieces based on the measurements you took in step 9. Attach your 2-by-2s using the power screwdriver and 2-inch wood screws. Add your shelves using the power screwdriver and 2-inch wood screws. You may need shorter screws if you're attaching the shelves to the dowels. If dowels are compromised, rotted or unable to affix to, replace them with 2-by-2s. Add your top perch using the power screwdriver and 2-inch wood screws. Add carpet pieces to the shelves using the staple gun and staples. Hang toys from the ladder's steps. Paint ladder to match your existing décor. Add paint, fabric or carpet to the base to match your existing décor. Add batting and colorful fabric to the top perch for a comfortable napping area. Wear protective eyewear when using a circular saw.